In the two days since the Ravens’ 35-7 victory over the Steelers (never get tired of typing that), I’ve heard several talking head and sports talk radio caller types droning on about how the Ravens were somehow “piling on” or “disrespecting” Pittsburgh when Sam Koch ran the ball in for two after B’More went up 27-7 early in the third quarter. Give me a break, Hiney. I know his feelings were probably just as hurt as the rest of his body was after the game, but that’s just some sour grapes whining right there. Not only that, but that line of thinking is patently WRONG. Far from being a sign of disrespect from the Ravens, the decision to exploit the Pittsburgh special teams in that situation was much more a show of RESPECT to them. Respect to the abilities of both their vaunted defense and their star quarterback to bring them back. Did Hines and the rest of the “disrespect” card-playing crowd already forget what happened the last time the Ravens and Steelers met? Just like this time around, the Ravens had 21 points at the half and the Steelers had 7. And then after four quarters, the Steelers had 31, and the Ravens had 24. One need only go back to THE LAST GAME these two teams played to find the Ravens’ justification for trying to score absolutely as many points as possible, every chance they got, on Sunday. 2008 Week 4 – Ravens hold a double digit halftime lead in Pittsburgh, 13-3. Steelers win in overtime, 23-20. 2008 Week 15 – Ravens lead 6-3 at the half. Steelers win 13-9. 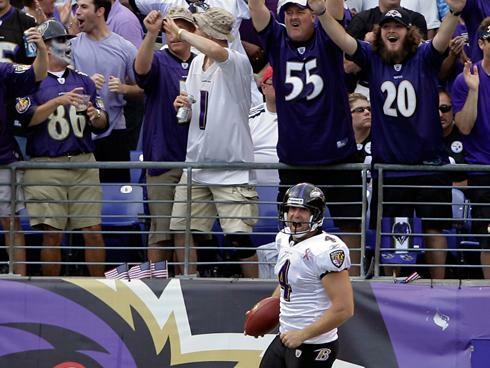 2009 Week 12 – Ravens lead 14-7 at the half. Steelers force overtime before Ravens win 23-20. 2010 Week 4 – Ravens lead 10-7 at halftime. Steelers take the lead and Ravens need a last-minute drive to win 17-14. 2010 Week 13 – Ravens lead 7-0 at the break. Steelers win 13-10. Notice a trend here? The Ravens lead at halftime, the Steelers come all the way back and at least take the lead, if not win outright. And somehow the Ravens are supposed to be comfortable with even a 28-7 lead with 29:40 left in the game? A three touchdown lead, in the minds of Ravens fans everywhere, could have been easily overcome by a strip-sack fumble recovery by Troy Polamalu, a deep bomb to Mike Wallace, and a Ben-wriggling-out-of-a-sure-sack to lob a 15-yard touchdown pass to Heath Miller. That one additional point, at that juncture in the game, meant that Pittsburgh would not only have to score three touchdowns to tie the game, but they would also, at some point, have to try for and convert a two-point conversion of their own. One that the Ravens would be expecting. It put the contest just that little bit further out of reach, which was absolutely the right thing to do when the opportunity presented itself. Mike Tomlin left his starters in the game until the final snap when Terrell Suggs brought down Roethlisberger for the third time. He wasn’t giving up. So why should the Ravens stop scoring? This is the NFL, people. The Ravens weren’t running up the score or disrespecting anybody by opting to try to go up by 22 points instead of 21 with nearly an entire half of football left to play. They were recognizing the skill and determination of an opponent that has proven time and again more than able to overcome most any deficit against them. That they were unable to do so Sunday was a testament to the fact that the Ravens never stopped trying to put them out of reach. This entry was posted on September 13, 2011 at 7:09 pm and is filed under Ravens. You can follow any responses to this entry through the RSS 2.0 feed. You can skip to the end and leave a response. Pinging is currently not allowed. Did you see that Flacco and Rice are on this week’s cover of SI? I don’t know who I feel sorry for next week. The Titans who have to watch the film of the Ravens-Steelers game or the Seattle Seahawks who have to deal with a pissed off Steelers team. Tarvaris Jackson might die on Sunday. I don’t think Hines was saying the Ravens shouldn’t have gotten as many points as possible … he was saying it was going to be remembered and used as motivation to not let it happen again. As far as the talking heads …. well that’s what they do! One talking head did make the point that it was such a good play that they should have saved it for when they might really need it. The Ravens finally kept the pedal to metal for a complete 60 minutes against the Steelers. While the Steelers turned it over every time they were seemingly gaining momentum, the Ravens continued to be aggressive. I thought the Ravens really exposed the Steelers linebackers in this one. Although Flacco had good numbers, how many times did he actually throw the ball more than 10 yards? He had the two big TD completions, but most of his yards came on check-downs or underneath routes. As for the 2 pt conversion, I wouldn’t call it disrespectful but it’s easy to see how it could become bulletin board material. I agree a “trick play” like that should have been saved for a more significant scenario. if they don’t get it, and the steelers magically come back, then theres the point win by the steelers…. There was no “if they didn’t get it.” They saw that weakness in the Steelers’ FG block unit on the first three extra points. The play had a 99.999% chance of success. Great call. Nope, you’re an idiot. It was 100% out of respect. Go read what I wrote again. And sure, they Steelers have the RIGHT to whine about it…doesn’t mean they’re not butthurt little babies for doing so. Who cares if you “piss them off?” They SHOULD be pissed off after losing 35-7. So the Ravens should have TRIED to win 21-20, just so Pittsburgh takes it easy on them the next time they play? GTFO. Although Flacco had good numbers, how many times did he actually throw the ball more than 10 yards? He had the two big TD completions, but most of his yards came on check-downs or underneath routes. So he only threw deep when he had a guy for six? What’s wrong with that? And don’t forget about the long throw to Dickson that was called back for holding. How many times did Ben throw deep? The Steelers respected Lee Evans, which opened up everything underneath. When you have a guy that can run after the catch like Ray Rice, there is absolutely no shame in getting the ball in his hands. Hell, Joe Montana’s entire career was a series of 10 yard passes to let Jerry Rice and John Taylor rack up the YAC. While the Ravens are an Air Coryell team and not West Coast, per se, Flacco did a great job of going through his reads and taking what Pittsburgh was giving him. If Tennessee decides to come up and try to take away Rice underneath, Joe will burn them over the top – the guy has one of the best deep balls in the NFL, and the Ravens now have the speed to utilize it. See, Flacco takes so much undeserved heat from everywhere, I see it when it isn’t even there. Yeah, Harrison looked gassed, Woodley wasn’t much either, and Timmons appears severely overpaid – all based on just one game, of course. Ask Tarvaris Jackson on Monday, and he’ll probably disagree.